Scientists at the Universities of Toronto, Stanford, and Columbia have developed a technology called mass cytometry that measures the action and function of candidate prescription drugs faster and on a larger scale. The team’s findings appear this week in the journal Science (paid subscription required). Mass cytometry enables the measurement of up to 100 biomarkers in single cells at a rate of about 1,000 cells per second. Biomarkers are specific physical traits of cells that indicate the effects or progress of a disease, illness, or condition. The technology analyzes thousands of microscopic particles per second by suspending them in a stream of fluid or gas and passing them through an electronic detection apparatus. 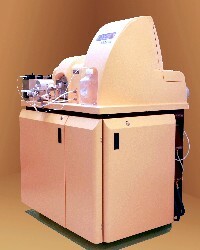 That apparatus uses atomic mass spectrometry, which can measure the number and type of atoms that comprise the sample. The researchers say mass cytometry has the potential to transform the understanding of a variety of diseases and biologic actions, and will provide a better tool to understand how a healthy cell becomes diseased. Clarifying the underlying biochemistry of cells can help detect illness earlier and advance personalized medicine by offering more tailored treatment options for patients. The research led to the development of an instrument (pictured above) to simultaneously measure a large number of these diagnostic signals for individual cells at a high analysis rate. The team used the technology to monitor 34 different substances found inside and on the surface of different cell types produced in human bone marrow, the place where all immune and blood cells, as well as blood disorders such as leukemia, originate. The researchers were able to correctly categorize over a dozen different immune cell types. They were also able to peer inside the cells and learn how various internal processes differed from one cell type to the next. Much of the technology and instrumentation was developed by the University of Toronto team members. DVS Sciences Inc., a spin-off company from the university is bringing mass cytometry to market. Toronto chemistry professor Scott Tanner, who led that part of the project, is also president of DVS Sciences.